Having watched the first episode in Japanese now, I find the English voices to be very good matches for the Japanese voices. The dubbing company did a good job on voice actor selection. The opening theme segment gives a good feel for what life is like for the haibane. The designs for the town are very nice. The style used for the backgrounds, the pans across them, direct the eyes smoothly over the buildings, the doors and windows, shops, streets, and stairs. The various scenes shown one after another give a good feel for the environment. This episode moved along with a nice, slow pace. The characters and their world are unfolding slowly, teaching both the viewer and Rakka about how the haibane co-exist with humans. Furthermore, not only are the haibane forbidden to leave town, but the humans as well. Why are they confined to the city’s outer walls? Why doesn’t the toga have a halo? For a second episode, the pacing of story and characters is nice. 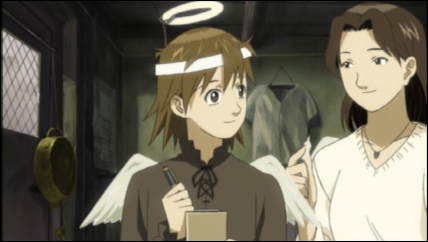 I also wonder why the haibane may not use money, and what was the purpose of Rakka leaving a feather with her signature? Maybe the feather is what proved Rakka was a new haibane to the Haibane Renmei. Nemu says Kana acts like Reki used to, which suggests to me that the haibane do age (as per my prior curiosity about it). This leaves them as being like humans reborn with wings, given a halo and told they (like the humans) may not leave town. 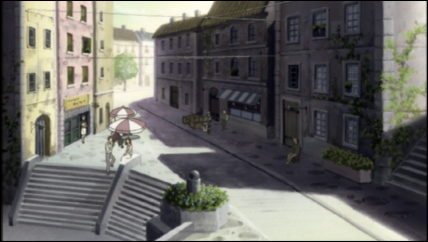 They’re essentially kept closed off from the rest of the world, the haibane and the humans who know of them. The thrift shop guy wins points for cutting and sewing the wing slits into the outfit for Rakka. 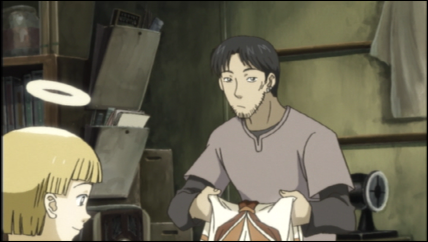 I’ll be watching to see if any of the purchased outfit pieces appear worn by the haibane in later episodes. Kuu has quickly become my favorite, being a bright-eyed, energetic character. Her wearing a sweater with a single pocket in the front is still a plus. Our discussion reminded me about it and I ordered the Haibane Seikatsu Nisshi booklet at Mandarake. It may be a bit more expensive than Yahoo Auctions, but I never got a hang of those. Outfits reappear constantly. Haibane generally do not possess a whole lot of clothing. I, too, was wondering my Haibane are not allowed to have money. Obviously it’s tool by which CFF (The Renmei) controls them, and also it may in fact be profitable for CFF. The cover story is that the money flow is from CFF to haibane: CFF supposedly use the profit from their trade monopoly to subsidize the haibane in their care. But it’s not like I saw their accounting books. If the original story were true, it would make sense just disburse money to haibane, instead of creating what amounts to the food stamp program. The latter makes sense in human world since there’s a significant potential for abuse (e.g. using all the money for meth instead of food), but I’m not so sure the whole story checks out in case of haibane. As for aging, since you seem to be unusually interested and since it’s not going to be a big spoiler at this point: you’re going to see flashbacks of younger Nemu, Reki, and Hyoko. So they definitely grow and change. Regarding Kuu, without giving it away, I’d like you to watch out for her relationship with Rakka. When I watched HR, it always surprised me how understated everything was between the two, until BAM! it becomes a VERY IMPORTANT STORYLINE. I want to know, what in the world am I missing here? P.S. Is there a specific reason why HR episode posts do not appear at the front page? The episode posts do appear on the front page, but it’s probably not that obvious. They’re to the side, under “Recent Episode Commentaries and Analysis”. I’ve love to reformat the main page to make things more organized and give episode commentaries a little more space while not giving them too much, but I’m no good at layout design, or really anything visually artistic. The main reason for the current layout is that episode commentaries won’t quickly bury posts such as the Mao-chan manga post I’ll be posting this week. Between continued Janggeum’s Dream posts (coincidentally my top hits generator, I suppose ’cause no one else blogging has heard of/seen this series), my Mythical Detective Loki Ragnarok posts (episode seven commentary up next, which looks rather empty compared with the upcoming Haibane-Renmei post), and the next Aria the Animation, I find my non-episode commentary posts end up buried at a decent pace if they’re mixed together.